In the common law tradition, a conviction at the criminal bar is constituted by a verdict of guilt beyond a reasonable doubt. [i] Verdicts reflect an interpretation of the evidence heard at trial and an assessment of the competing parties’ theories of it. A theory of the evidence is also called an “argument”, presented as an address to the jury. An argument in this legal sense is grounded in an inference to the best explanation, which is the most common form of abductive reasoning. So we may say that a guilty verdict is the conclusion of a suitably strong abduction, and that a verdict to acquit is a judgement to the effect that the evidence permits no abduction of requisite strength. A jury’s task is to adjudicate between the rival abductions proffered by opposing counsel in their closing statements. It is also possible that a juror might reject the arguments advanced by counsel and make his own interpretation of the evidence. Either way, the jury’s task is complicated by the fact that nearly always the sum total of the evidence heard at trial is internally inconsistent. This gives all three parties – prosecution, defence and jury – occasion to trim the evidence with a view to reining in its inconsistency. This is done in one or other of two ways, singly or in combination. Juries will either base their determinations on a consistent proper subset of the total evidence, or they will form subsets of it that retain some of the inconsistency, but assign to its competing elements different weightings. It is therefore entirely commonplace that the abductions advanced by opposing counsel proceed from different subsets of the total evidence. Nor is it uncommon that the evidence tied to the jury’s own abduction is yet a different subset of the evidence, although usually they overlap fairly significantly. Accordingly, a lawyer’s address to the jury will typically have two components. One is a presentation (sometimes implied rather than expressed) of reasons for selecting his particular subset of the evidence. The other is the advancement of what he takes to be the best explanation of it. By the time a case goes to the jury, it is often the case that the trier of fact is faced with two rival abductions explaining two rival bodies of evidence. It falls to the trier of fact to assess not only the strength of these rival abductions, but the soundness of the evidence-selection choices to which they are tied. On the face of it, these features place criminal verdicts at risk of incommensurability. Let the prosecution’s and defence’s theory the case be schematized as follows, with ‘G’ representing “guilty as charged” and ‘E’ and ‘E’’ representing different and usually mutually incompatible subsets of the evidence heard. Prosecution: G best explains E.
Defence: ~G best explains E’. In the first case, one’s ignorance is removed by new knowledge, and a new position is arrived at which may serve as a positive basis for action. In the second case, one’s ignorance is fully preserved, and is so in a way that cannot serve as a positive basis for new action. With Planck’s example in mind, we can give a general schema for abduction, as follows. Let T be an agent’s epistemic target at a time, and K his knowledge-base at that time. Let K* be an immediate successor of K that lies within the agent’s means to produce. Let R be an attainment-relation on T and Rsubj a subjunctive-attainment relation on it. K(H) is the revision of K upon the addition of H. C(H) denotes the conjecture of H and H* its activation. Accordingly, the general structure of abduction is as follows. Here, too, and notwithstanding what might be suggested by the Planck example, it is advisable to guard against a misconception. When we say that an abduction involves the activation of a hypothesis in a state of ignorance, it is not at all necessary, or frequent, that the abducer be wholly in the dark, that his ignorance is total. It need not be the case, and typically isn’t, that the abducer’s choice of a hypothesis is a blind guess, or that nothing positive can be said of it beyond the role it plays in the presumptive attainment of the abducer’s original target. Abduction is not mysticism. In particular, it is not foreclosed that there might be evidence that lends the hypothesis a positive degree of likelihood. But when the evidence is insufficient for activation, sometimes explanatory force is the requisite “top-up”. Loosely speaking, abduction often is a deal-closer for what induction cannot attain on its own. Of course, some criminal prosecutions are open and shut. They leave no one in any doubt about who did what to whom. Sometimes those cases are defended for merely strategic reasons, often in the hope that a losing defence may nevertheless influence a judge’s decision on sentencing. [vii] But in the usual run of cases, a defendant will go to trial with a plea of not guilty if he thinks that the Crown’s case can be effectively rebutted or if he thinks that, rebuttable or not, it doesn’t rise to a proof beyond a reasonable doubt. In the majority of such cases, the total evidence will embody significant inconsistencies. Not only will the evidence led by opposing counsel be in conflict, but witnesses for either side may in various respects contradict one another. This presents a juror with two ignorance-problems. Although he must decide who is telling the truth, by and large he will have to perform this duty on some basis other than knowledge. And, having selected which segments of the evidence he is prepared to accept, a verdict of guilty by and large is also rendered on some basis other than knowledge. While it cannot be foreclosed that a jury will sometimes lodge a conviction in the manifest certainty of the accused’s guilt, in the general case a conviction will be underdetermined by what a jury knows. A theory of the evidence is meant to close the gap between what the juror knows and what he desires to know. In the cases we are discussing, a prosecution’s closing argument is an argument to the effect that the hypothesis that best explains the evidence is that the accused is guilty as charged. If a juror accepts that evidence and accepts that it provides the best explanation, his remaining duty is to determine whether the explanation is strong enough to justify a conviction. A juror may select a different subset of the evidence and may have a different view of what best explains it. When this happens he must determine whether the hypothesis of guilt is a better explanation and strong enough to justify a conviction. Even so, a jury cannot convict on that basis. Its duty is to determine whether the Crown’s theory of the case supports conviction, not that its own theory of the case does. On the other hand, a jury may acquit an accused on this same basis. If a jury fashions its own theory of the case in which the winning hypothesis is incompatible with the hypothesis of guilt, it has a duty to bring in a verdict of not guilty. [c]onvictions should not be overturned simply because this court determined that the circumstances do not exclude every reasonable hypothesis of [the] evidence. ([Klotter, 1992, p. 69]). While the Indiana ruling does not say so explicitly, it would appear to allow for the possibility of a theory’s superior explanatory force being undermined by the jurors’ doubts about the credibility of the particular subset of the evidence which counsel offers it as explaining. In other words, a losing theory of the case might have the greater explanatory power in relation to evidence the jury has trouble with than that possessed by the other party’s explanation of the evidence that jury is more disposed to accept. We should also note that, on rare occasions, the evidence that a jury is prepared to accept admits of only one possible explanation. In such cases, it is perfectly proper for the jury to make a “transcendental” inference in the form: “These are the facts. These facts could not have obtained except that the accused committed the crime with which he is charged. Consequently, we must convict.” Transcendental arguments are regressive or backwards chaining arguments, but they are not abductive, since, when they come off, they are not ignorance-preserving. But I say again that the occasion for a jury availing itself of a transcendental inference is comparatively rare in actual practice. Conviction has two components. The jury must find that the hypothesis abduced by the prosecution is strongly explanative and that no rival hypothesis permitted by the evidence is more explanative. The jury must also determine that the best explanation is strong enough to meet the criminal proof standard. In so saying, a nasty difficulty presents itself. On the face of it, this second condition cannot be met. The reason is that abductions are ignorance-preserving, leaving the jury not knowing whether the accused is guilty as charged. This flows from the logical structure of abduction. Accordingly, the hypothesis of guilt is a conjecture, it is an educated guess. How can an educated guess qualify as any kind of proof, still less a proof beyond any reasonable doubt? This is trouble bad enough to deserve a name. My choice is the Criminal Abduction Paradox. [r]easonable doubt is a term in common use as familiar to jurors as to lawyers. As one judge has said, it needs a skillful definer to make plainer by multiplication of words … ([Strong, 1999, p. 517]). This is a remark wholly typical of the epistemological orientation of the common law. Its fundamental concepts – proof, inference, relevance, probability, among others – are presumed to be adequately understood intuitively, that is, in the absence of analytical tutelage. What is more, the common law embodies a certain scepticism about definitions and formal explications, according to which an analysis of terms is either redundant or conceptually distorting. Both these sentiments can be found in the lines I have just now quoted. I will not take the time to dwell on the haplessness of these high court explications, beyond saying that they are multiplications of words that make things less plain, not more. [x] Even so, the model charge of Lifchus also contains a further sentence that may be of some use to us. In short, if based upon the evidence… you are sure that the accused committed the offence you should convict since this [i.e., the conviction] demonstrates that you are satisfied of his guilt beyond a reasonable doubt. (13-14). The concept of the reasonable man or, as we must now say, reasonable person, lies at the heart of the law of tort, where it helps distinguish strict liability from the liability of fault. In this usage, it is the subject of a great deal of finely wrought analytical instruction by judges and, so, is an important exception to the law’s epistemology of tacitness with regard to its foundational concepts. But the idea of the reasonable person also leaves its tracks in other quarters of the law, notably in its conception of how juries are to be constituted and what they can be considered capable of doing. Juries – both criminal and civil – are made up of ordinary persons who have had no expert or formal tutelage in the matters they will hear in evidence. In most common law jurisdictions, a professional training in any such matter disqualifies a person from jury duty. In this same spirit, it is assumed that the reasoning and reflection that the jury will be required to bring to bear on the evidence will be of a kind and of a quality open to the ordinary person reasoning in the ordinary way of things. Here, too, if a judge actually did think that a formal training in, say, Critical Thinking endowed its owner with expertise in the matter, he would disqualify him from serving. This teaches us an important lesson about reasonable doubt. In its commitment to the reasonable-person model of the trier of fact at the criminal bar, the law presumes that the standard of proof beyond a reasonable doubt is routinely meetable by ordinary persons reasoning in the way of ordinary persons. 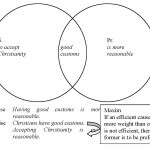 What is this “reasoning in the way of reasoning persons”? It is intuitive and unreflective reasoning. It is reasoning that omits the open calibration of performance to criteria. This means, in particular, that when a juror finds an accused guilty beyond a reasonable doubt, he (the juror) has no duty to make – and in general would be wholly incapable of making – the case that his verdict meets the stated standard. There is a second moral to draw. It is widely believed that the criminal proof standard is a particularly high one, and artificially so. That is to say, that it is a standard higher than one that would suffice for determinations of guilt in non-juridical settings – think, for example, of a university’s misconduct committee – and artificial by virtue of the fact that it is imposed by the courts as a hedge against wrongful conviction. This is twice-over a mistake. If compared to the standards of mathematical demonstration and scientific confirmation, the criminal standard is pretty small beer. And since it is a comparatively low standard, its remarkable loftiness cannot be a matter of courtly imposition. It is quite true that courts do impose artificialities that serve as hedges against wrongful conviction,[xii] but the criminal standard of proof is not one of them. Since juries don’t proceed by aiming at standards and don’t succeed by aligning their thinking to their criterial requirements, in other words, since jurors are not hit-the-mark thinkers, it remains to speculate on how the proof standard is actually met. Here the last-quoted observation from Lifchus is suggestive. A juror must convict if, upon attending to the evidence, he is satisfied that the accused is guilty as charged. And since, in reaching that state of mind, he is not a hit-the-mark thinker, satisfaction here is an operational concept, not a criterial one. A juror’s satisfaction is not to be confused with his belief that the accused is guilty or his judgement that the accused is probably guilty, or his feeling that the accused could not possibly be innocent, but rather is constituted by the decision to convict. The satisfaction is implicit in the conviction. A. The criminal proof standard is not particularly high, and is attainable without tutelage by any reasonable layman. B. The comparative lowness of the criminal standard in no way strains the core meaning of the concept of proof. C. A prosecution is an attempt to defeat the presumption of innocence. A defence is an attempt to defeat that attempt. A verdict of guilt survives all available effort to defeat it. Perhaps we might think that we have made some progress in attaining a better understanding of the criminal proof standard. In what we have suggested so far, we have placed good deal of weight upon the notion of satisfaction. [xiii] But satisfaction is no less ambiguous a concept than the law’s other foundational concepts. If we leave it in this undisambiguated state, we compromise the criminal standard interpretation that rests upon it. It is not that we have done nothing to clarify our intended use of “satisfy”. We have said that being satisfied that H is, in this legal sense, different from believing that H, judging H to be probable and thinking H’s falsity impossible. But what, we might ask, is its further positive mark, and in what way does it bear essentially on the structure of abduction? What is it to convict a man for murder knowing that you do not know whether he is guilty of it? The general form of this question is answered in the logic of abduction. There is a presumption that risky actions should be circumscribed in the absence of certainty. This is the fundamental principle of risk aversion in conditions of uncertainty. The costlier the consequences should one’s action turn out to be mistaken, the greater the need to mitigate uncertainty before the action is taken. This is a wisely conservative principle, but like most good things we can have too much of it. In its most extreme form risk-averse conservatism is equivalent to our second – or do-nothing – response to an ignorance-problem. No one thinks that this is the right form of the principle in general. Abduction, or the third response, risks action in the absence of knowledge, even where such actions are neither trivial nor reversible. Even so, the weightier the consequences of being wrong, the stronger the abduction must be. This cues a further operational remark about satisfaction. D. Knowing the risks, one’s satisfaction with H is constituted by one’s activation of it, the higher the risks, the greater the satisfaction. According to the general schema for abduction, a conjecture is activated when the abducer releases it for premissory work in the disciplinary contexts in which the originating ignorance-problem arose in the first place. This is one way – the abductive way – of sending a conjecture to trial. One puts it to work, and one sees what happens. It is quite true that sometimes a conjecture is sent to trial without the intervening step of activation. In such cases, the conjecturer does not act on the hypothesis he has arrived at until its bona fides have been subsequently established. As common as this practice may be, it is not abduction according to the general schema. Some may see it otherwise. They may think that the example at hand shows the general schema in a bad light. Lacking an interest in unedifying semantic wrangles, I am prepared to split the difference. Such cases are not abductions in full; they are partial abductions. This has a direct bearing on the abductive character of theories of the case. When a prosecutor conjectures the guilt of the accused and the defence conjectures his innocence, it lies in the nature of criminal proceedings that neither party can put his respective conjecture to work in ways that qualify as activation. Activation falls to the jury. So we may say that a distinctive feature of theories of the evidence is that they are partial rather than full abductions. My limited purpose here has been to explain away the Criminal Abduction Paradox by demonstrating, on the contrary, that the criminal proof standard, both in its height and the manner of its attainment, is low enough and ordinary enough to permit satisfaction by the shared structure of the Crown’s case, with the Crown making the conjecture of guilt and the jury activating the conjecture. It has not been my further purpose to suggest that in general the results of such abductive partnerships at the criminal bar are epistemically satisfying. My sole claim here is that they are not paradoxical. What, then, of their epistemic reliability? It is a harder question to answer than we might like it to be. Such empirical work as presently exists is disturbing. In an investigation of several hundred Michigan jurors, fully twenty-five percent asserted that “you have a reasonable doubt if you can see any possibility, no matter how slight, that the defendant is innocent” ([Kramer and Koening, 1990, p. 414]. Quoted from [Landau, 2006, p. 49]). In another study, one in four Florida-based jurors found that when the evidence is evenly balanced between guilt and innocence, the defendant must be found guilty ([Strawn and Buchanan, 1976, pp. 480-481]. Quoted from [Laudan, 2006, pp. 49-50]). Discouraging as these findings are, there may be some reason not to take them at face-value. For if, as has been suggested here, a jury’s finding is intuitive, unreflective and non-criterial, the very questions that prompted these answers are of a type that require reflection, and reflection in terms that may not have entered the jury’s actual thinking. Accordingly, there may be some room for hope that they inadequately reflect what was actually in those juries’ minds as they reached their decisions. But this is a matter for another time. For helpful criticisms and suggestions I thank Maurice Finocchiaro, Dov Gabbay, David Godden, David Hitchcock, Andrew Irvine and Erik Krabbe. For technical support, Carol Woods was invaluable, as always. i. It is perhaps a trifle presumptuous to be giving a talk on the common law in a country with so distinguished a record in the code tradition. But we all live in a “Perry Mason”, or more recently, a “Law and Order” world, such is the present state of American pop-cultural influence. This is probably background enough to be getting on with, however. ii. This is attempted in [Woods, 2007c]. iii. Ignorance-problems are discussed in greater detail in [Gabbay and Woods, 2005]. iv. The proposal that activation is essential to abduction is discussed in greater detail in [Gabbay and Woods, 2005]. v. Non-explanatory modes of abduction appear prominently in “reverse mathematics” pioneered by Harvey Friedman and his colleagues e.g., ([Friedman and Simpson, 2000]). The idea of reverse mathematics originates with Russell’s notion of the regressive method in mathematical logic ([Russell, 1907]), and is also present in some remarks of Gödel (1944, 1990]). vi. Roughly speaking, what this means is that H has a no more plausible and relevant rival constituting a greater degree of subjunctive attainment of T.
vii. Still, such cases are rare. It is much more common for defendants to “plead out” in return for an antecedently agreed-upon lighter sentence. viii. [Klotter, 1992] defines circumstantial evidence as follows: “Direct evidence proves a fct without inference ¼ Circumstantial evidence is evidence from which a fact is reasonably inferred but not directly proven.” (pp. 67-68). x. Such a discussion may be found in [Woods, 2006]. xi. It is not too much to say that in common law jurisdictions the question of the teachability of the criminal standard of proof is in substantial disarray. In a remarkable ruling, the Supreme Court of the United States (In re Winship) found that there was a constitutional obligation that criminal juries were, without exception, to be instructed that guilt beyond a reasonable doubt is necessary for conviction. Given that judges must now tell juries that they are subject to this standard, a question naturally enough arises as to whether judges should also go on to tell juries what the standard means. It bears on this that recently England has abandoned a practice of two centuries of having judges instruct jurors about the meaning of the standard. What has brought this about was pressure from legal theorists to the effect t hat “reasonable doubt could be neither defined, nor uniformly understood, nor consistently applied” ([Landau, 2006, p. 76]). Much the same view prevails in a number of U.S. state jurisdictions. In Oklahoma and Wyoming, to take just two examples, a judge’s instruction on the meaning of the standard is automatic grounds for reversal (Pennell v. Oklahoma, 640 P.2d 568 at 570 (1982), and Cosco v. Wyoming, 521 P. 2d 1345 (1974) at 1346). On the other hand, fifteen states require that the standard be defined, while most appellate courts discourage the practice. The Seventh Circuit Court of Appeal “admonished district courts not to define ‘reasonable doubt’.” (U.S. v. Martin-Tregora 684 F. 2d 485, at 493 (7th Cir. 1982). In 1994, the Fourth Circuit Court ruled that when a jury asks for a definition of the standard, a judge is at liberty to refuse. (U.S. v. Reives, 114 S. Ct. at 2679 (1994). The Supreme Court has never managed to decide whether reasonable doubt should be defined, finding that the Constitution is non-committal about whether a definitional obligation exists (Victor v. Nebraska, 114 S. Ct. at 1243 (1980). xii. Notably in judicial determinations of the admissibility of evidence, the Crown’s burden of proof and the presumption of innocence. xiii. If space permitted, a good deal more could (and should) be said about what might be called the psycho-epistemic orientation of satisfaction. Interested readers might consult [Woods, 2005], [Woods, 2007a] and [Woods, 2007b]. xiv. Nor should we lose sight that in common law jurisdictions, most criminal convictions are not appealed, and most appeals are lost. So much for the reversibility of wrongful convictions. Harvey Friedman and S. Simpson, “Issues and problems in reverse mathematics”, Compatability Theory and its Applications: Contemporary Mathematics, volume 257, pp. 127-144, 2000. Dov M. Gabbay and John Woods, The Reach of Abduction: Insight and Trial, volume 2 of A Practical Logic of Cognitive Systems, Amsterdam: North-Holland, 2005. Kurt Gödel, “Russell’s mathematical logic”. In The Philosophy of Bertrand Russell, edited by P.A. Schelpp, 3rd edition, pp. 123-153, New York: Tudor, 1944. Kurt Gödel. “Remarks before the Princeton biocentennial conference on problems in mathematics”. In Solomon Feferman, John W. Dawson Jr., Stephen C. Kleene, Gregory H. Moore, Robert M. Solovay and Jean van Heijenoort, editors, Kurt Gödel: Collected Works, Volume II, Publications 1938-1974, pp. 150-153, New York and Oxford: Oxford University Press, 1990. Originally published in 1946. John C. Klotter, Criminal Evidence, 5th edition, Cincinatti, OH: Anderson Publishing, 1992. Geoffrey Kramer & Doorean Koenig, “Do jurors understand criminal jury instructions?”, U.Mich. J.L. Ref. 401, at 414 (1990). Larry Laudan, Truth, Error, and Criminal Law: An Essay in Legal Epistemology, Cambridge: Cambridge University Press, 2006.